Since I'm about to fly off to Texas to look at some privately owned Toyen originals and other fun Czech modernist items, I thought I had better drop by Animal Rescue League and entertain Bingo for awhile. And, of, course, any other rabbits who chose to be interested. At home, Ms. Spots takes her daytime nap very seriously, and Orion too is usually sleeping under the couch most of the afternoon. But not Bingo. I don't think Bingo has any preferred nap time. Show any interest in him, and he's ready to get up and go--out of the cage, leaving his scent everywhere possible in the Rabbit Room. The Bingomatic Rabbit is nearly a perpetual motion machine, although he will settle down for long petting sessions after he's run around for awhile. Bingo's very popular with the rabbit volunteers and has always struck me as a goodnatured creature. Unlike the other bottom-cage rabbits, I've never seen him try to bite any rabbit that ventured close to his cage (today he had Tomas, Maggie, and Babs in a frenzy of territorial aggression). Bingo apparently does have strong feelings about individuals, however. One person did tell me awhile back that she didn't think he liked her (he warmed up to her during the afternoon, though). Today a young woman dropped by to visit the small animals, and since Bingo was out, she decided to reach over and pet him. To our astonishment, he flew at her snarling! In fact, he did it twice. She said perhaps she smelled too much of cat, and proceeded to make a guinea pig happy instead. It may indeed be that Bingo doesn't like the smell of cats, but surely he smells cat every day on the shelter workers, and he has no reputation for attacking them. With all due apologies to our visitor, I suspect that Bingo just didn't like her. Shortly after she left, Bingo settled down for a long and rapturous petting session with a human he knows he likes. This afternoon I enticed Travis, just back from a semester of teaching in Minnesota, over to Animal Rescue League for an afternoon of rabbit-petting (the shelter's Hug-a-Bun Sunday). I hadn't been over there lately due to traveling and the Blackboard class, so I wasn't sure how many familiar faces I'd see. Sophia and Charlie were still there, as was Babs and the charming spotted pair Hansel and Gretel, but who did I see in the corner cage but... Bingo! A few weeks ago, Bingo was going into a frenzy of excitement whenever I arrived. Then he was due to be adopted. But here he was in his old spot and looking quite dejected. Suzanne, one of the official rabbit volunteers, said that he had almost been adopted, but that the girlfriend of the guy who wanted him was much too hesitant about the project and seemed to think Bingo ought to be confined to a small area. This would have been even less appropriate for a rabbit like Bingo than for the average rabbit, so the adoption never went through. I had, for no rational reason other than wanting Bingo myself, had a feeling that maybe the adoption wouldn't take. I'm glad to know that Suzanne and the other official volunteers (I'm completely unofficial) look out for the rabbits' best interests so carefully. Bingo needs lots of mental stimulation, much of which comes from exploring his surroundings. He's not a good candidate for life in a confined space. He loves two things: activity and petting. If he gets enough playtime, he's ready to be held and petted for long periods, but even without playtime, he needs his petting. I petted Bingo for a good long time and then we let him roam the room while the other rabbits were petted in enclosures or on laps. He was in a better frame of mind by the end of the day, but was definitely in slow motion compared to a few weeks ago. Suzanne confirmed that the rabbits tend to get depressed if they stay in the shelter for several months, despite the best efforts of the volunteers. I'll have to make a point of visiting him more while I'm in town. Other rabbits had some very good petting from Travis and the other attendees. A couple of rabbits were brought over in the hopes of finding companions, which was interesting to watch, but no definite matches were made. Anjou, a white rabbit, was introduced to Jubilee and briefly to Sophia, but he was more in the mood to sit on his human's lap than to meet other rabbits. It's possible he was afraid he was being brought back to the shelter to stay. A very large rabbit--fifteen pounds so not one of the real giants but hefty nonetheless--got to meet Maggie, Jubilee, and Sophia. He was thrilled. Jubilee wasn't crazy about him but both Maggie and Sophia thought he was awfully appealing, even though he was at least three times their size. I thought it wouldn't be hard to bond him with either one of them, but his humans were really looking for a doe closer to him in size, so for the time being Maggie and Sophia will have to live without him. Travis was much impressed with the friendly rabbits and knowledgeable humans. We agreed that we should mention the rabbit get-togethers to our colleagues, since some of them would really like a pet but feel that grad school isn't the time to get one. An afternoon spent petting shelter rabbits benefits both rabbits and humans. When I got home, Ms. Spots indicated that she thought the number of scents on my clothes were a bit overwhelming, even though some were familiar. Orion, as usual, took no interest in all the scents and merely wanted to be petted. We completed our Blackboard/Courseweb training on Thursday afternoon, and I'm sure everyone was glad to get out of the basement of Alumni Hall and away from the surprisingly glary fluorescent lights. I'm not sure how the CIDDE people survive in this environment, although admittedly it doesn't bother me when I go over there to spend a couple of hours with the Digital Sender. While at times it was tedious, I think we all learned a lot and were impressed with the instructors. Part of what a person gets out of this kind of class is an awareness of what can be done and that there are several ways of doing some of these things. The details can always be looked up in the manual later. A nice bonus was that each person met individually with someone to discuss how best to arrange specific courses on Blackboard. The Intro to Modern and American Art courses I'll be teaching in the fall are relatively similar in style--both are introductory lecture courses that rely heavily on Powerpoint presentations of the works of art--but we decided that since Intro to Modern (in this iteration) is a once-a-week course (last time I taught it, it met three times a week! ), the materials could be divided by week, whereas since American Art is twice a week and divided into units, the materials would be posted by unit rather than week. This would matter more if I had more online readings for American Art, but as it happens, most of the supplemental readings are in two anthologies that will be available at the bookstore. The Blackboard training definitely gave me some new ideas. Last time I used Blackboard, I didn't use the grading function. Now that I know how it works, I will. More excitingly, there are possibilities for more effective teaching. Both of these courses (neither being a large lecture) will have the students divide into two groups and each group present readings to the other group. In the past, the groups discussed their readings briefly in class before presenting. This took up class time and I had only a general idea which people were contributing more to the discussion. Blackboard offers online discussion groups, however. This means my groups can do most of their discussion in advance, I can read over their contributions and assign participation credit, and in class they should only need a few minutes together before presenting orally. Blackboard also has built-in blogs and wikis. I don't see myself using these for my fall courses, but if I get to teach Czech Modernism in the spring, I think I'll have the students create a wiki. The Czech Modernism course would probably be done as one of our upper-division courses that stresses learning to write research papers, and as there are far fewer resources on Czech modernism than on something like Impressionism, having the students incrementally put their findings on a wiki throughout the semester would not only document the progress of their paper research for me, but would strengthen the entire class's knowledge of the topic because they would be building a group resource with citations to their sources. A student preparing a paper on the architect Otakar Novotný would benefit from sources located by a student working on Jan Kotěra, and vice versa. Each student would do his or her own project, yet benefit from the entire group's research. Blackboard, for those not in the academic world, is a means of preparing and disseminating course materials online. You can do everything from just posting the syllabus online to teaching an entire online course. Blackboard is not mandatory, and I suspect many people in my department are still not using it despite the fact that they put parts of their courses online. I first used it several years ago, the last time I taught, when I used it to post the syllabus, a handout or two, and the Powerpoint presentations from class. It seemed to me, however, that as I had only used Blackboard once and in a limited way, and as new versions had come out since then, I had really better see what it had to offer me. The university offers several different types and lengths of training, so I decided to go ahead and commit to four full days in the hopes that this would ensure I got more than just basics that I could have figured out on my own. While tiring and sometimes slow-moving, this four-day version is thorough and goes well beyond Blackboard itself to address ways in which we might want to use it. We have learned, for instance, how to record ourselves digitally using the free software Audacity, and how to put the result up on Blackboard. I doubt I will be recording myself, but it did occur to me that I have mp3 files of some CAA panels and if I ever wanted to assign one of these instead of a reading, this would not be hard to make available. We also had a session relating to images, and while most of the information in that was painfully basic for me (definitions of pixel, JPG, GIF), it was well presented and not basic for most of the others, and I actually got advice on how to deal with the problems I encounter scanning many European books, which use a printing process that often causes a really horrible scanned result. Something about the arrangement of the dots can cause not a classic moiré pattern, but more of a nasty speckly effect, and this can be alleviated by scanning at 300 or more dpi and using the descreen feature, plus if necessary other tools. We've also had a fairly long session on copyright, which was interesting but perhaps went into too much detail on some aspects of copyright and not enough on others, given what the participants seemed to know about the subject. People had a fairly good grasp of Fair Use, so it was good to have this refined regarding how Fair Use relates to classroom and distance education, but when it became clear that most people in the room (despite having published many articles and books) had no concept of the rights that can be transferred or retained in publishing, I thought that either this topic should have been left to a separate non-Blackboard training or that basic ideas such as First North American Print Rights and Work for Hire ought to have been explained. But I'm used to dealing with writers who have at least looked through Writer's Market or a comparable text before sending off a manuscript. Academic writers are notorious for ignorantly letting their publishers take ownership of their work in ways that no other freelancer would countenance, and this doesn't seem to have changed since I first began thinking about the problem in the early 90s (in a past life, shall we say). Blackboard is in some ways a relatively complex delivery system, which while designed to give some amount of standardization so that students can easily find what they're looking for, also allows various arrangements of material. Part of becoming proficient at Blackboard is figuring out the best way to arrange the materials so that students can easily find and use them and not end up sending their assignments to the equivalent of Siberia, or send the professor messages that languish in a dungeon unknown to the professor. My needs are more straightforward than those of some teachers, since I rely heavily on Powerpoint, assigned readings, and a small number of writing assignments, but I want these things well placed, so I am looking forward to my private consultation with one of the instructors. I also want to learn how to set up discussion boards so that my students can easiily discuss their readings prior to coming to class and doing group presentations, as this will free up some class time and also give me a clearer sense as to which students are really contributing to the discussion. That said, it's time to go to class. The Spotted Pair and I had an uneventful trip to Jesse's, although I enjoyed it more than they did as they dislike car travel and were not too pleased about the heat in Jesse's apartment either. But a pleasant time was had by the human contingent. The Spotted Pair will be staying home for my next trip, which involves going to Minneapolis for the gigantic Berkshire Women's History Conference, which should be rather exciting. I'll be giving a paper there on the New Woman in interwar Czechoslovakia, which is the last of my rather long string of conference papers. No doubt other tempting conferences will come along, but it seems time to turn some of those papers into articles... well, when not writing other things, like final bits of dissertation and chunks of fiction. Perhaps Ms. Spots could be trained to somehow turn conference papers into articles for me, picking through my notes to add on additional material and get rid of as many images as possible. She is, after all, an intelligent creature. On the other hand, I suspect her interest in my research is almost nil. She believes my time is best spent petting her and purveying yogurt and other treats on demand. Summer, as people around me note, has finally arrived in Pittsburgh. And it's evidently going to be the standard Pittsburgh summer weather: when I got up this morning it was allegedly 78 degrees, with a high of 92 expected. As the Spotted Pair and I are driving up to Ann Arbor today to celebrate Jesse's imminent PhD, one would think we might be escaping this excessive heat. But no. The Ann Arbor forecasts are pretty much identical to those for Pittsburgh. Fortunately the car is airconditioned. I will now continue my packing and see if the Spotted Pair can be lured out from under the couch. I guess I should have left earlier in the day when they were lounging under the dining room window. When I stopped by the Animal Rescue League late yesterday afternoon, all the rabbits were surprisingly sleepy--except, of course, Bingo, who wanted my attention right away. Bingo wanted to be petted for a long, long time, and then he wanted to go out and take a tour of the floor. In the meantime I noticed a note on the board announcing that Bingo was "pending adoption." Not knowing when the adoption might be final, I thought I had better spend some good time with my pal. And this afternoon I saw that he had been taken off the adoptable list, so I assume he has gone to his new home. I hope, of course, that his new home satisfies all his dreams. But I feel ambivalent, since I'll probably never see him again. I'm fond of all the rabbits there, but it's only natural that some interest me more than others. I try to spend time with Sophia because she's a shy rabbit who needs a friend. I try to persuade Charlie not to head for the back of his cage whenever I open the door (Charlie is determined not to be petted, it seems). I'm making an effort to pet Babs more because even though she hates other rabbits, she likes to be petted. Basil was just one of those beings that anyone in their right mind would take to. There have certainly been several rabbits who made me want to take them home. At the same time, a person just forms a special connection with specific individuals, whether other humans or members of another species. Calypso Spots and I have that connection, and Orion has it with Calypso Spots. Bingo is quite a different rabbit from Ms. Spots (the Princess of Pittsburgh or Spotted Odalisque), but we were developing that connection. It's too bad I haven't felt that my circumstances allowed me to get another rabbit. I'll always remember Bingo, just as I'll always remember a rabbit named Bombay who I could have adopted but thought would be bullied by my doe Penelope. I hope Bingo's new human doesn't mind that he still sprays, that he likes to chew and shred things, and that his new human enjoys the way he races around. I hope his new human thinks he's the finest rabbit in history and gives him lots of petting, and finds him a good doe for company (he and Honey did flirt quite a bit). Bingo's a highly intelligent creature and will be glad to live with the right human. 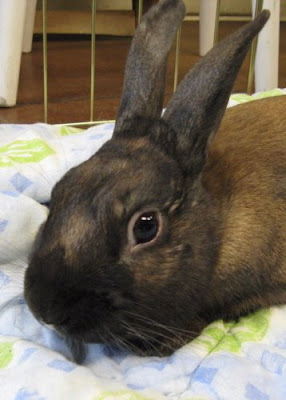 The number of rabbits at Animal Rescue League was dropping in a most satisfactory way. Not only was Basil adopted, but apparently so was the little lionhead rabbit (who was another of those exceptionally nice beings), and perhaps one or two others. And when I stopped by on Sunday afternoon, I discovered that Guapo, the white rex, who wants nothing else in life but to be petted by a nice human, seems to have found his human. One of the other Pittsburgh House Rabbit members, who was grieving her lost rabbit, had come to see Guapo and the two of them fell in love. I'm not sure how Guapo will be able to stand the wait until the adoption can be taken care of, because he likes this human even more than he likes me. But Bingo kept asking me to come back, so we had some more petting and then he persuaded me to let him out. The chart in the rabbit room indicated he had already been out (as had all the rabbits), but Bingo can doubtless use all the exercise time he's given. I can see why Bingo wouldn't appeal to everyone--he's a whirlwind of activity--but he's very intelligent and goodnatured. I wish I could take him home. But of course Ms. Spots and Orion would have an opinion on that, and I think Ms. Spots would have the deciding vote, as Senior Rabbit. She does find Bingo's scent of great interest, whereas Orion is much more interested in my bedding than in any possible trace of Bingo on my clothes. There are rumors abroad that Bingo and Honey have taken an interest in one another. It's true Honey doesn't mind Bingo romping in front of her cage, but for that matter Jubilee seems to have decided he might be ok too. (There is no hope that Babs will take to him. She even growls at Guapo. She likes to be petted, though.) Honey looks like a very fine rabbit, but I confess I have more of an interest in Sophia, who needs enough petting to bring out her true personality. Sophia strikes me as a rabbit who could end up as confident and friendly as Ms. Spots, given the right home. In the meantime, however, it appears the shelter has had a population explosion. There were about 10 rabbits there when we left Sunday afternoon, but this evening no less than 6 spotted rabbits have joined the list. They must have been dropped off sometime today. These new rabbits are described as English Spot, but I think they are simply spotted rabbits. Judging by the photos, they're a very attractive group. But why six at once? Every time there's a little progress on the adoption front, more animals arrive. Two words: SPAY and NEUTER. And don't get animals you can't keep. Readers in the Pittsburgh area might want to go and check out the Alternative Focus exhibition at Silver Eye Center for Photography. 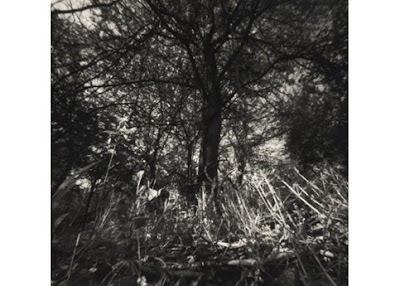 The show, up until June 14, features pinhole photography by Jesseca Ferguson and Tom Persinger. The two photographers use the same basic technique of lensless photography to achieve very different effects with disparate subjects. Jesseca Ferguson assembles still lifes using objects she has collected, prints the result using various older photographic techniques, and then incorporates them into assemblages in which old papers and book covers become background to the photograph. I liked the general effect, but was a little disturbed that in some of the works she had used old handwritten documents (letters? ), all of which seemed to be in Polish. As a historically minded person, I wanted to know what these documents said (I can read a little Polish and recognized a lot of words, but not enough of the documents were visible) and to feel sure that these weren't anything anyone would ever want. I had the feeling that somebody's interesting account of immigrant life was probably irretrievably cut up and glued up, and this bothered me. As a collage artist myself, I'm always torn between enchantment at the effects people achieve with old materials, and anxiety that they could be ignorantly tearing up valuable books, documents, and photos that simply happened to be available cheap. One man's junk is another man's treasure, but it could be treasure in one way to one person and treasure in quite another way to someone else. Tom Persinger's photographs, which were what I had come to see, are scenes of forests and swamps. The pinhole process requires longish exposures, so the images are not crisp (leaves move a little, water refuses to be still), but have a rich, almost velvety look. I'm not sure how much of this is the result of the pinhole technique and how much is his printing process (I think they were all silver gelatin prints). There was a time when I was fairly serious about photography, but I only got as far as learning the basics of doing my own prints, so I'm ignorant about the benefits of different printing processes. You can see more examples of the photographs here.